This is Wayback Wednesday, your midweek blast from the past! In this feature, we dig into the archives, look back at the history of basketball gaming, and indulge in some nostalgia. Check in every Wednesday for retrospectives and other features on older versions of NBA Live, NBA 2K, and old school basketball video games in general. You’ll also find old NLSC editorials re-published with added commentary, and other flashback content. This week, I’m taking a look back at DBF files in the PC versions of NBA Live. Our community has produced several amazing mods over the years. We’ve been able to go from fairly basic roster updates to comprehensive total conversions, and a wide variety of tweaks and enhancements. Of course, some games have been easier to mod than others. The feasibility of modding a game generally comes down to the format and structure of the files; the easier they are to decode and manipulate, the easier it’s been to develop tools to edit them. At times, developers have gone out of their way to make this task easier. CustomArt is one such example, while DBF files are another. Roster data in the PC versions of early NBA Live games was stored in a way that made it a lot more difficult to edit. Upon modifying rosters in-game, such as changing the lineups or trading players, a file called rosters.dat was created. Data for created players was also stored in this file, while the data for all default players was stored in the executable. Modifying original players therefore required editing the executable file in addition to rosters.dat. The process was easier in NBA Live 96 and NBA Live 97 – especially with the latter’s ability to save and load separate roster files within the game – but it was still limiting, especially when it came to distributing mods. 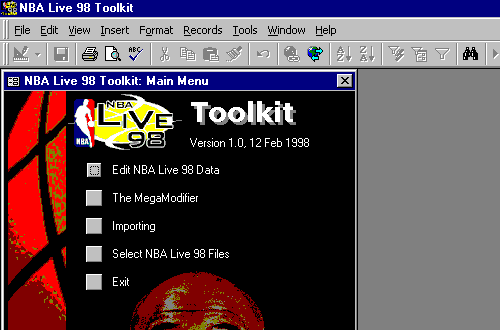 NBA Live 98 PC would change all of that as the game used a new format for storing roster data, namely DBF files. With the adoption of these database files, data for both created and original players was stored in the same place. Any changes to the rosters, such as trading players or reordering the lineups, updated the respective values in the DBF file. Team data was also stored in its own DBF file, which made it a lot easier to change team names, reassign art files, and make other modifications that previously required editing the game’s executable. Because each roster save utilised its own DBF files, there was less fuss when it came to installing and distributing custom rosters. Best of all, DBF files were not an EA-specific file format. This meant that they could be opened by readily available commercial software, such as Microsoft Access and Microsoft Excel, or DB Commander. As long as the software supported opening and saving the files in the appropriate DBF format, it could safely be used to tinker with the rosters. This meant that people in the community (chiefly Tim, Lutz, and Brien) didn’t have to decipher the structure of an executable file and write specific software that could be used to edit the roster data. With the appropriate database or spreadsheet software, anyone could immediately start modding the roster files as they wished. However, this could be a daunting task, especially for novices. 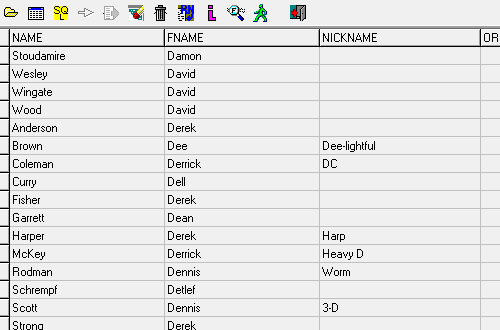 The editors that Tim, Lutz and Brien developed for NBA Live 95, 96, and 97 not only removed the need to tediously modify the executable with a hex editor, it presented all of the roster data in a straightforward and visually appealing interface. It was easy to find data and change it as desired, thanks to clearly labelled fields and descriptive drop-down boxes. When you opened up a DBF file, you were greeted with raw data. Each field had a label that explained what the data was, but it wasn’t always obvious. After years of having easy-to-use editors at our disposal, some aspiring modders found it rather confusing. To streamline the process and make roster editing as accessible as it had been with the old editors, our founders developed a series of tools for working with the DBF files. Called the NBA Live Toolkit, the editors were Microsoft Access modules that once again presented the roster data in an organised fashion. The Toolkits also included functions such as the ability to make global changes, which came in handy during the era of tweaked rosters. One drawback of the Toolkit was that it required Microsoft Access to run, specifically the version it was created with. Later Toolkits had both a Microsoft Access 97 and Microsoft Access 2000 version, which suited most users. As our founders stepped away from the community, other knowledgeable members stepped up to create new versions of the Toolkit. Unfortunately, they too moved on, leading to panic from gamers who believed it would put an end to the roster updates. This wasn’t the case however, since as long as the games utilised DBF files, we could make use of other software to open and modify them. The process was more difficult for newcomers since we now had to edit the raw data directly, but once you’d grown to be familiar with the databases, it was trivial to make the changes that you wanted. To help out in the process, I created DBF Guides that can still be found in our Wiki. Even without the ease of a dedicated roster editor, the flexibility of DBF files meant that we could create outstanding and detailed mods. Custom teams could be added without in-game functionality. Combined with CustomArt, it was possible to have a mod like NBA Live Street installed alongside a current roster. Retro season packs were quite feasible, since team names and pointers to the art files could vary between roster saves. 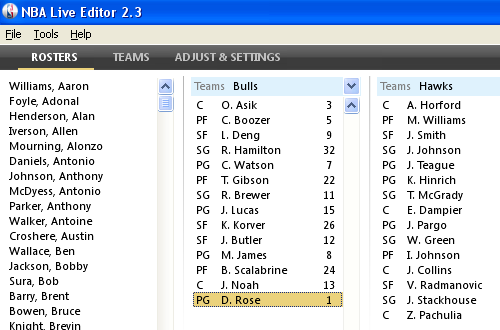 The ability to open the files with a program like Excel or Access also simplified the process of converting rosters for use with other games. This meant that for a time, I was able to simultaneously update four games with minimal fuss. That’s not to say that DBF files didn’t cause problems. If you were using a program like Excel and saved the file in the wrong format, it would be corrupted and unable to be loaded in-game. A few of the games stored certain data (such as the default Playoff seeding and arena names) in the default DBF files rather than in the individual roster saves, meaning that any changes had to be universal rather than roster-specific. If the temporary files in the CurrentDB and/or WorkingDB folders were corrupted, they’d cause crashes that could only be resolved by manually deleting the files. However, the benefits far outweighed the drawbacks when it came to the use of DBF files. Many mods continued to be made for NBA Live, long after EA Sports discontinued the PC releases. In 2012, a user with the handle Ayiep joined the community; noticing that NBA Live 08 utilised DBF files, he created an editor similar to the old Toolkits. 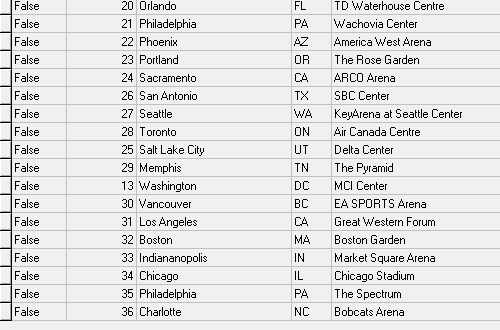 Due to similarities in the databases, he was able to adapt the tool for use with NBA Live 2005 through 08. 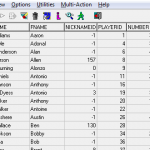 One drawback with the tool is that it saved the files in a format that made them illegible when opened with Excel, which in turn made it difficult to convert rosters between games. Aside from that, it could safely be used by gamers who felt overwhelmed by opening the files in Excel or DB Commander. Upon diving into some NBA 2K modding this year, I’ve definitely come to miss the ease of DBF files. Granted, the roster data in prior gen NBA 2K is organised into a similar style of database, which meant that once Vlad decoded the file format and developed REDitor and RED MC, we’ve been able to edit NBA 2K with similar ease. Of course, that did take time, whereas DBF files allowed us to make all kinds of edits from the moment we installed NBA Live 98 onwards. On this generation, NBA 2K’s rosters have taken on a different format, requiring the use of tools that can be more cumbersome and even result in your account being banned for hacking. If the PC version of NBA 2K is to ever truly be as modder-friendly as the old NBA Live PC releases were, it will need to adopt a similar format to DBF files. Likewise, if NBA Live does return to the PC platform at some point, I hope that modding will be facilitated by DBFs, or a similar type of database file. Used in a decade’s worth of releases, it was clearly a reliable format for the developers as well. Without a doubt, it was one of the most significant developments in modding, ushering in the golden age of tinkering with NBA Live on PC. It’s something that makes the prospect of updating those old NBA Live games remain appealing, even after all these years.